PARIS (AP) — French President Emmanuel Macron said Monday that he hoped a 73-year-old yellow vest protester who suffered a head injury after being charged by police in Nice gains “wisdom” over the incident. The Nice prosecutor said he had opened an investigation to uncover how anti-globalization activist Genevieve Legay was injured, and who, if anyone, was responsible. However, prosecutor Jean-Michel Pretre noted that the Saturday demonstration was “at once illicit and forbidden” and participants had been summoned to leave before the police charge. 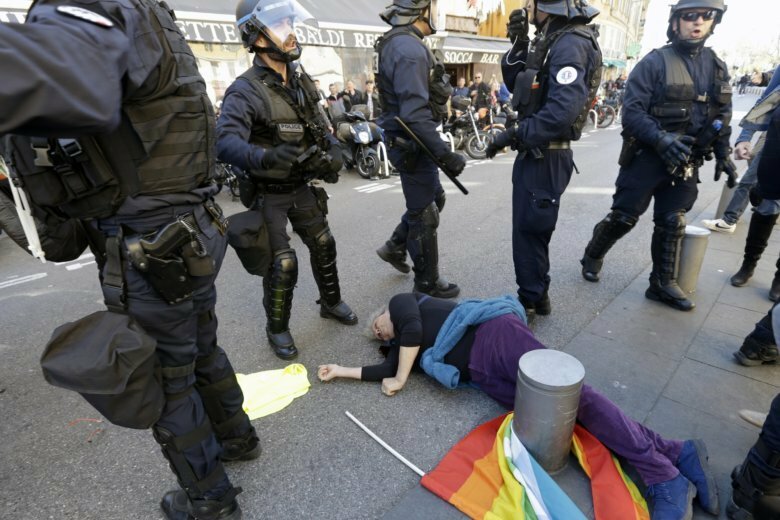 An Associated Press reporter saw Legay, who was waving a rainbow flag marked “Peace” and holding a yellow vest, fall to the pavement, blood spilling from her head. The prosecutor told a news conference that Legay “was pushed” from behind and fell to the ground, fracturing her head, which hit a metal pole. She received a 3 centimeter gash, but was talking, coherent and remained hospitalized for surveillance.